If you are reading this, you likely know how rabid of an Orioles and Ravens fan I am. But despite growing up supporting my orange and purple birds, I also grew up revering football players who wore green and gold. You see, my Dad is a lifelong Packers fan. Born in New Jersey, he ended up choosing the Packers because at a young age his favorite color was green and he liked this guy named Bart Starr. Sure as a child growing up in the 60s he was jumping on the bandwagon of a winning team, but he stuck with them as they “wandered through the wasteland” (his words) of 29 seasons between Super Bowl victories until Brett Favre and Reggie White returned them to the promised land when I was 6. So as I grew up learning that Babe Ruth was the Baseball legend, I also learned that Vince Lombardi and Bart Starr were the football legends. At least, that’s what was taught at the Gillette home. So for 25 years now, my family and I have made it our mission to physically turn our house into a Packers house. For pretty much every birthday or celebration, we looked for some Packers gear my father didn’t have. He now is the proud owner of blankets, books, DVDs, hats, jerseys, even things as ridiculous as grilling gear, all adorned with the famous Packers’ G. But despite all of the emotional, physical and financial investment my father had made in the Green Bay Packers, he had never once set foot in Green Bay, Wisconsin. 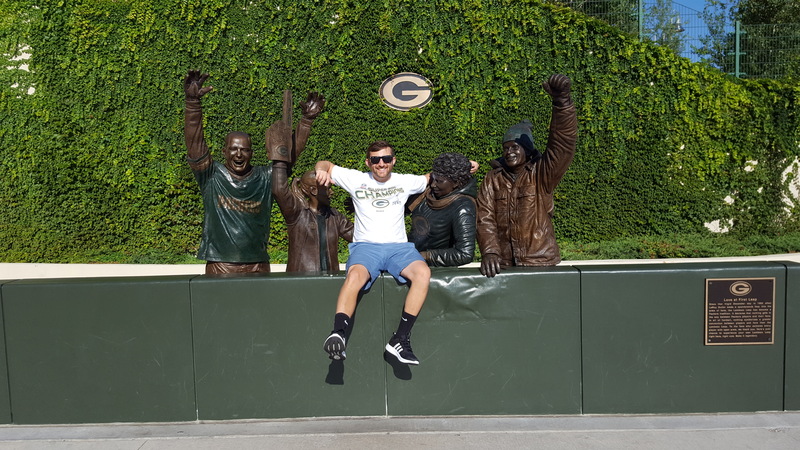 So as I began plotting my cross-country drive to begin my life out in Oregon, I had an epiphany: take Dad to Lambeau. We quickly made plans to make it a reality, and as we drove up I-43 from Milwaukee towards Green Bay, my Dad thanked me for convincing him to come along. My “convincing him” consisted of calling him back in March and saying “Hey Dad, what if we went to Green Bay on my way to Oregon?” As we arrived in Green Bay around 11:00 pm, we spotted the stadium lit up from the highway. We drove around it, smiling uncontrollably as we finally gazed upon the enormous building that housed so many incredible memories and stories of both of our youths. Today we got to step inside the hallowed grounds of Lambeau field. Inside the stadium there is an incredible Packers museum/Hall of Fame, and in the blink of an eye, the two hours we had to spend inside before our tour were behind us. I stood in awe as we approached the 13 championship (4 Lombardi) trophies, watched the inspirational speeches from Curly Lambeau and Vince Lombardi, and relived the incredible throws of Starr, Favre and Rodgers. My Dad said he even got choked up – while watching a highlight video of Ray Nitchke’s bone crushing hits. 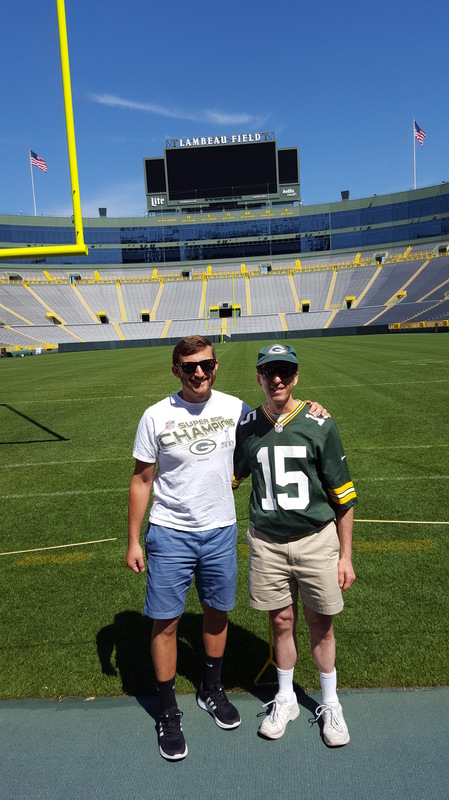 Our day inside football Mecca wrapped up with a “GO PACK GO” chant that echoed back at the 20 some odd people on our tour, and my Dad and I walked arm in arm from a moment we’ll never forget. In the year and a half since I wrote “Home,” my life has changed in many ways. But one thing I have always known still emanates from my soul: sports are special. From the freedom I experience chasing down a fly ball, to the adrenaline I feel cheering on my team to the smiles and laughs I shared with my father walking around a 100 yard patch of grass, nothing quite mesmerizes me like sports. Maybe I’m making the right decision pursuing a career in it after all. Thank you for telling us about this very special day shared by a loving father and son. Brings tears to my eyes, a smile to my lips, and warms my heart. This was so very awesome!!!! What a wonderful memory for you and your cool Dad. You are most definitely on the right path.